Excelta offers a Variety of Brushes and often times selecting the appropriate brush for the right application is a daunting task. For this reason, Janel has outlined several brushes to make the selection process easier. P Brushes use hog hair bristles which is soft and slightly firm that gradually becomes thinner towards the edges making these brushes useful in a number of different applications. These brushes are also water resistant and can tolerate temperatures up to 500 degrees Fahrenheit. H Brushes use horse hair bristles are soft and slightly stiff like the hog hair and are mostly used in scratch free applications on a dry surface. These brushes are heat resistant up to 370 degrees Fahrenheit. N Brushes use nylon bristles which are mush more durable then the horse hair and hog hair brushes. Also these brushes resist solvents, most chemicals, and bacteria. However these bristles only resist temperatures up to 250 degrees Fahrenheit. The Clean room Safe "-N" Brushes use a material called Statigo9 for their bristles. This material is static dissipative acetal which makes them ESD Safe and just durable as nylon but thicker. This enables the operator to use the brush for mechanical work. These bristles are not held together with any adhesives, just like the ESD Safe Brushes, so they will not contaminate the work space. 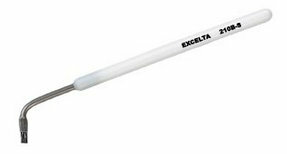 To browse more Excelta Brushes click on the provided link here.